Rotaract Club members prepare food drive boxes. Bellevue College’s Rotaract Club has organized a food drive with the aid of Northwest Harvest. This food drive is the club’s November project. 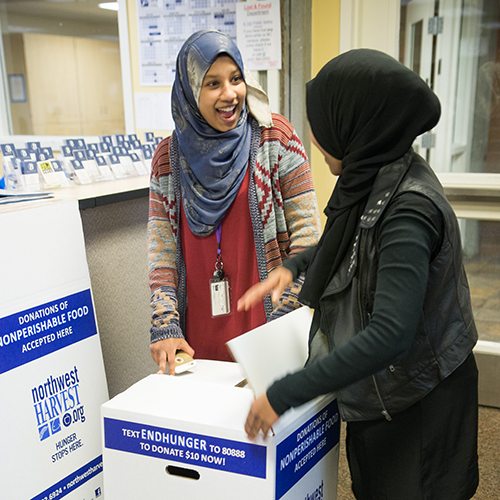 Students are encouraged to donate nonperishable food in one of the collection boxes that will be on campus this month. Club members set up collection boxes around campus which will remain in place for the duration of the food drive. There are five boxes in total: Three in the C building, one in the L building and one in the S building. The Rotaract club Vice President Ayah Idris said that there were reasons for the placement of each one. Rotaract Club members Owla Mohammed and Ayah Idris prepare food drive boxes. She said that the L building is also a hub. The S building box will be available for students taking classes in building S or T. “It’s a convenient area for people on that side of campus to drop stuff off,” Idris said. “Service clubs are always something I’ve been a part of,” said Owla Mohammed, another Rotaract club member. She’s also been involved with the club since last year. The club’s last project was a bake sale to raise funds for a playground “for kids of all ability,” said Idris. The club members package food for Northwest Harvest on the first Saturday of each month. Food is organized by type and then sent to food banks in the area. Northwest Harvest then redistributes food to food banks. They also do this with nonperishable food items which are the type that students are asked to donate this month. Other than that, there is no restriction to what students can provide. Idris said that students with questions or interest in joining the club are welcome to come to one of the meetings. Rotaract club meetings are Mondays from 12:30 – 1:30 p.m. in room C211.